Edward Wyllis Scripps (June 18, 1854 – March 12, 1926), was an American newspaper publisher and founder of The E.W. Scripps Company, a diversified media conglomerate. Scripps was the first to create a chain of newspapers in the United States. One of Scripps' greatest achievements was the founding of United Press International (UPI), the news service he founded in opposition to the Associated Press monopoly. Scripps believed that the news should be made available to any news outlet, unlike AP which operated on a membership basis. UPI was successful for several decades, with a large number of well respected "Unipresser" reporters associated with it. It continues to be one of the world's major news agencies, along with the Associated Press, Agence France-Presse, and Reuters. E.W. Scripps was born in Rushville, Illinois, on June 18, 1854, to James Mogg Scripps, from London, England, and Julia A. Osborne from New York. He had five brothers and sisters. His grandfather had issued the London Literary Gazette, and many of his relatives in United States were connected to publishing business. Both Scripps and his half-sister Ellen worked with his older half-brother, James when he founded The Detroit News in 1873. At the age of 18, Scripps started as an office boy at the paper, later serving on business and editorial functions. In 1877, with loans from his half-brothers, Scripps went on to found The Penny Press (later the Cleveland Press) in Cleveland, Ohio. With financial support from sister Ellen, he went on to begin or acquire some 25 newspapers. This was the beginning of a media empire that is now the E.W. Scripps Company. Scripps had a talent for the publishing business. He studied people to find what they needed the most, and then he created his news around that. He believed that the differences between people were the products of accident and environment. Scripps was also a firm believer in independent news, fighting against local corruption. His papers were low-priced and frequently supported progressive causes and the trade union movement. Scripps would lend money to promising young, local newspaper publishers, and buy the successful one, having 51 percent share of the paper. Once bought, he did not "sell out," but held on to the paper. A guiding tenet of Scripps was that local editors knew best about running local newspapers. Editors were carefully groomed and given considerable autonomy. Among the innovations Scripps made were distributing newspapers to the suburbs and, with his brother James, of getting the bulk of income from advertisers instead of subscribers. In 1880, Scripps took over the St. Louis Evening Chronicle and then the Cincinnati Post. With the Detroit and Cleveland papers, he formed the first newspaper chain in the country. However, due to his disagreements with other members, particularly because of his liberal views, Scripps left the group soon afterwards, taking only the Cincinnati Post. In 1889, Scripps and Milton A. McRae founded the Scripps-McRae League of Newspapers. In 1897, Scripps organized the Scripps-McRae Press Association, which later became United Press Associations. In 1898, Scripps finished his home at Scripps Ranch, San Diego, California, thinking that the dry, warm climate would help his colds that he had all his life. He built it as a winter-home to escape the cold of Illinois, but eventually lived there year around, and conducted his newspaper business from the ranch. 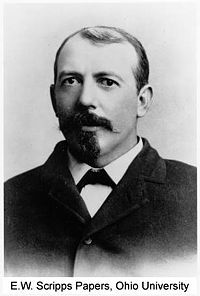 In 1902, he founded the Newspaper Enterprise Association (NEA). During 1906, he founded the Denver Express, Evansville Press, Pueblo Sun, Terre Haute Post, Dallas Dispatch, Portland News, Oklahoma News, Memphis Press, and Nashville Times. Scripps eventually owned 34 newspapers in 15 states. After the Associated Press (AP) refused to sell its services to several of his papers, Scripps combined three regional news services—the Publisher's Press Association, Scripps McRae Press Association, and the Scripps News Association—into the United Press Associations, which began service on June 21, 1907. Scripps founded United Press, later called United Press International, on the principle that there should be no restrictions on who could buy news from a news service. The AP was owned by its newspaper members, who could simply decline to serve the competition. Scripps had refused to become a member of AP, calling it a monopoly. Scripps believed that there should be no restrictions on who could buy news from a news service and he made UP available to anyone, including his competitors, which soon included William Randolph Hearst's International News Service. This formula made UPI a direct threat to the alliances of the major U.S. and European wire services of the time. Scripps Institution of Oceanography was founded in 1903, as the Marine Biological Association of San Diego, an independent biological research laboratory by University of California zoology professor William Emerson Ritter, with support from Ellen Browning Scripps and later her brother, E. W. Scripps. They fully funded Scripps for the first several years. 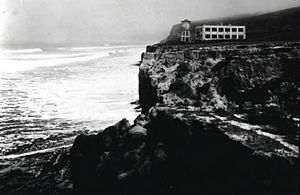 Scripps began institutional life in the boathouse of the Hotel Coronado located on San Diego Bay. Thereafter it re-located in 1905, to La Jolla on the head above La Jolla Cove, and finally in 1907, to its present location. In 1912, Scripps became part of the University of California and was renamed the "Scripps Institution for Biological Research." During the 1960s, led by Scripps Institution of Oceanography director Roger Revelle, it formed the nucleus for the creation of the University of California, San Diego (UCSD) on a bluff overlooking Scripps Institution. In 1903, he and his half-sister Ellen were the founding donors of the Scripps Institution of Oceanography. Initially Scripps was reluctant to support the venture, thinking scientists could not be business-like. However, he developed a deep friendship with the scientific director, William Emerson Ritter, and together they began to plan projects for the Institute. As the Institute started to succeed, he became an enthusiastic supporter, and took a great interest in its work. In 1920, Scripps started the Science Service for newspapers. In 1922, he transferred the interests in his company to his son, Robert Paine Scripps (1895–1938), and with Roy W. Howard formed the Scripps-Howard chain, replacing the Scripps-McRae League. Later in his life, Scripps became somewhat of a hermit, calling himself a "damned old crank." He enjoyed sailing the seven seas on a yacht, smoking 50 cigars a day. He died at the age of 71 on March 12, 1926, on his yacht off the coast of Liberia. Scripps was a newspaper publisher, organizer of the first major newspaper chain in the United States. Today, the E.W. Scripps group—also known as Scripps-Howard—is one of the smaller U.S. media conglomerates, having under its umbrella some daily and weekly newspapers, broadcast, and cable television. Among others, it includes newspapers in seventeen U.S. markets, several television stations such as HGTV, the Food Network, DIY Network, Great American Country, as well as several online shopping services. The E.W. Scripps School of Journalism at Ohio University is named for him. One of Scripps' greatest achievements was the founding of United Press International, the news service he founded in opposition to the Associated Press monopoly. Scripps believed that the news should be made available to any news outlet, unlike AP, which operated on a membership basis. Cochran, Negley D. 1933. E. W. Scripps. Harcourt, Brace and Company. Gardner, Gilson. 1932. Lusty Scripps; The Life of E.W. Scripps (1854-1926). New York: The Vanguard Press. Ritter, William E. 1926. Science Service as one Expression of E.W. Scripps's Philosophy of Life. Washington, DC: Science Service. Shor, Elizabeth. 1981 How Scripps Institution Came to San Diego The Journal of San Diego History, 27(3). Retrieved December 22, 2007. The Scripps Company—Official website of the company. United Press International official website. History of "E. W. Scripps"
This page was last modified on 4 October 2017, at 15:26.